A Bead a Day recently asked people to send in stories about giving jewelry to people who didn't expect it, just for being them, and I shared a story that has stuck with me. Over the years, I've given away what I call "Karma Jewelry" to people who've been in my booth and touched me in some way, but this particular person really got to me. 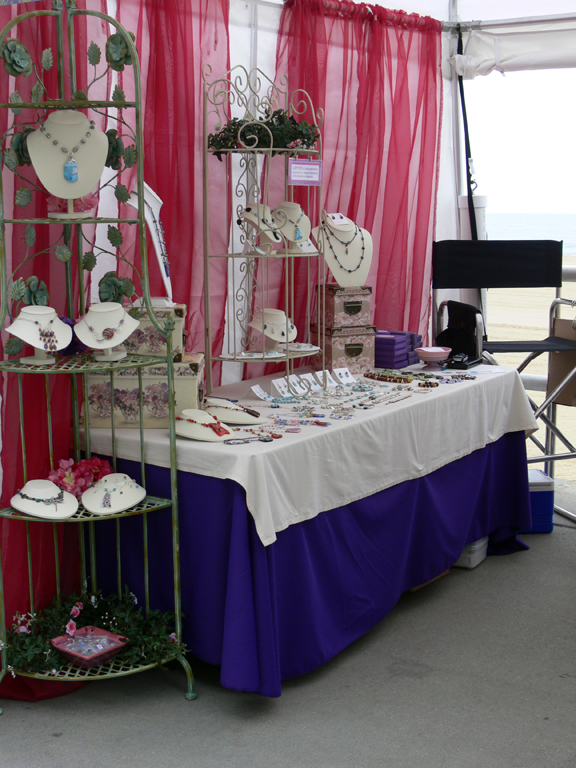 I was doing a show at the beach, and it was very early in the morning when I was setting up. A man in ragged clothes, carrying a backpack on his back, smelling like he’d been sleeping on the streets for a while, came into my booth. He had wild hair and was dirty but his eyes sparkled and he had a great smile. He started chatting with me, looking at my jewelry that was on the table, and started telling me about how he was a Vietnam vet, living on the streets, traveling the beaches where it was warm. I figured he was going to ask for money, so I reached for my bag to give him something. “Do you like veterans?” he asked. I told him I WAS a veteran, and was married to a retired Chief Master Sergeant. “Well maybe you can do something for me,” he said. I started reaching for my wallet again. He picked up a necklace I’d made. 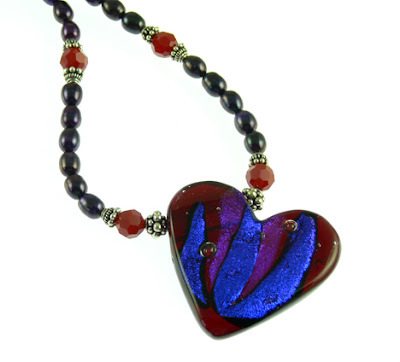 It had a dichroic glass heart in purple and red, with purple pearls. I put the necklace around his neck, he squeezed my arm in thanks, and he walked out of the booth whistling a tune. I just stood there, stunned, touched, and tearful. I’m thankful that I didn’t react like many may have, shooing him out of my booth. I’m thankful that I’d made something that he’d deemed a good substitute for the medal he’d won and lost. I’ll never forget that man, that necklace, or that morning. Such a sweet story. You made a huge difference in his life that day. I was selling at a farmers' market one frigid morning when a sweet but disheveled looking woman admired my things and said she didn't have anything that nice. She particularly liked the necklace I was wearing, so I offered it to her. I think it made me happier than it did her. I love this story of two beautiful hearts that connected that day. Thanks for sharing it, Lori. People who don't give have no idea how much joy it brings to both parties. Lovely story. That is a beautiful story Lori. It's as though you made that necklace FOR him! Thanks for sharing. You brought tears to my eyes- I suspect that your necklace remained a treasured possession for him. You are aware you have a sweet, soft, heart, right? Lori - Oh, what a wonderful story. It gave me chills and a smile. I grew up with the Vietnam war everywhere. Marched in protest rallies and married a soldier. Your story so touched me. Thank you for your kind heart. What a blessing for you the day that man chose to come into your booth. It's a gift that will last you a lifetime. Thank you for sharing. That's such a lovely story Lori. You obviously have a big heart and an open mind - two things I aspire to. Thanks for sharing it here, your post has really touched me. Beautiful story...that heart was meant for him. Hurray for Heros! You're one of mine. I LOVE the idea of Karma Jewelry. I frequently send beaded goodies to people I think are deserving too. And I think you are VERY deserving for your actions towards this gentle man, and also for sharing it with all of us. Please send me you're mailing address (my e-mail is on my bio on my blog, just link back to me). Oh, my, Lori! I'm in tears! What a wonderful story! That was such a kind gesture, and I'll bet he never forgot your kindness. Wow, a fantastic story, I'm almost speechless!! What a wonderful story, Lori. I have tears in my eyes! Such a touching story Lori! I'm sure you left a lasting impression on him. The tears in my eyes. As you know, my son is a vet. Maybe you don't know but my father and grandfather were both vets. Hearing their stories, especially my son's, I can understand how meaninful this moment is. And the message is we must step back from the appearance and hear the story. Thank you for doing that and thank you for sharing this story with us. Lori, that is such a powerful story. You have a heart of gold...not because you gave away that necklace you made, but because you saw past his exterior to the potential within. I am deeply moved by your story. Thank you for sharing that. Such a touching and heart warming story Lori. It's that old saying...it's better to give than receive. Thank you. Such a gift for you both! I am crying right now - thank you for sharing that story. I am sure he is treasuring that heart. You are amazing, one veteran to another! What a great story ... and a wonderful feeling to know that you had such a positive impact on another ... especially someone who was in such need emotionally ... and physically. I know that necklace will bring him comfort. That is an amazing story. I think I read it reprinted on another blog,too.Is that possible? I don't know if you have heard my sad news.You can check my blog. Lori, that is a such wonderful story, thxs for sharing it. Have a great week! Lori, I never heard this story from you before. You are right, you could truly write a book about your life experiences. This has to be right up there as one of the most memorable. What a beautiful story - I am so happy that vet found you that day at the beach. It was meant to be. I'm so proud to call you a friend! What a beautiful story to read to start off my day, thank you for that. And thank you and your husband for your service to our country too. My son joined the Army this year. How I admire his selflessness, yours, your husband's, that Vietnam Vet, my newphew, and all who give to our armed forces their time and life. God Bless! What a touching story. I have tears in my eyes. God bless all our Vets! A wonderful story, Lori. Ask, and you shall receive. What a great story! That made my day. And this is a perfect example of why I believe so strongly that everything happens for a reason. There are no coincidences, no luck, no right place right time. That beautiful moment was was created before that man stepped into your booth. Two Veterans, heros, coming together to share a special moment. These are the stories that remind us that life is all about unconditional love, kindness, and service to others. And you, Lori, have the kindest heart of anyone.